Lyle: He has nine lives and 5 strings and he plays lead guitar in the world's greatest rock 'n roll band. He is Keith Richards. Born on December 18th, 1943 in Dartford, England, Richards began playing guitar in bands by the time he was a teenager. In 1962 he formed the Rolling Stones with his childhood friend Mick Jaggar. Keith's musical influences come mostly from the early American blues guitar heroes such as Chuck Berry, Willie Dixon and Muddy Waters to name just a few. Lyle: His main guitar is an early '50s Fender Telecaster. It only has 5 strings, the 6th string is removed and it's always tuned to open G (G, D, G, B, D) low to high. String gauges are .011, .015, .018, .030, .042. He uses both Marshall and Fender amps, Marshalls for the dirty tone and Fenders for the clean tone, most of the time playing through both at the same time. Suggested listening: Honky Tonk Woman, Gimme Shelter, Satisfaction, Start Me Up. Lyle: We are going to be working in the open G tuning for this lesson. Just like Keith, you wont use the 6th string on your guitar, just the other 5. 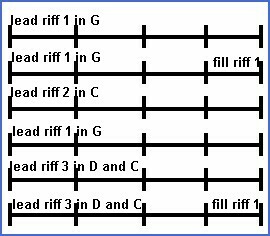 Lyle: The open tuning makes playing barre chords up and down the neck real easy by just using one finger to barre across the 5 strings. 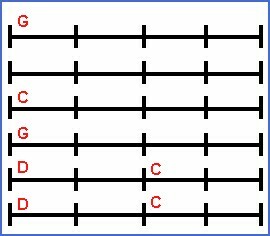 Here's an example of a bunch of chords you can play. The root note of the chord is on the 5th string. Remember it's tuned down a whole step, so the name of the note is different than what you're used to. Lyle: Now you try doing this on your own. Improvise this chord riff up and down the neck and you'll hear that familiar Stones sound come to life on your guitar. I suggest you have your amp set to a clean sound with just a small amount of drive. Lyle: For the D chord, you'll need to know this rhythm part. Play it twice through. Lyle: After you become familiar with the 3 different rhythm parts, practice them with the jam track until you are able to play along with the guitar on it. It should sound like one big rhythm guitar part.